Thailand Blasts: Has US Pivot to Asia Become a Brawl? An unprecedented terror attack unfolded Monday evening in Bangkok, Thailand leaving 20 dead and over a hundred injured. No single attack of this scale has been carried out in Bangkok before, prompting fears that Thailand’s enemies have raised their campaign of sedition and violence to grisly new levels. The Western media has floated several possibilities, attempting first and foremost to focus on the prospect of terrorists, either from Thailand’s troubled southern-most provinces, or from China’s Xinjiang region. Thailand’s southern-most provinces have seen a low-level insurgency rage since in 2001 US-backed dictator Thaksin Shinawatra took office and reignited violence after a nearly 20 year truce. However, violence within this conflict rarely erupts outside of Thailand’s south, and has never struck Bangkok. While US-Saudi linked terrorist groups in the region have attempted to turn the localized insurgency into a wider front in the politically and financially lucrative “War on Terror,” such efforts have so far failed. The West is also floating the idea that Uyghur terrorists carried out that attack – citing the fact that the attack was carried out in a location where predominately Chinese tourists gather – claiming it was in retaliation to Thailand’s decision to recently deport detained Uyghurs back to China. China claims those deported were terrorists caught being trafficked through Thailand’s south before being shipped to Turkey where they would then join NATO-backed terrorists fighting in Syria. It should be noted that immediately after the deportations just weeks ago, the US State Department funded and Washington D.C. based “World Uyghur Congress” (WUC) organized a violent protest which attacked and destroyed the Thai consulate in Istanbul, Turkey. 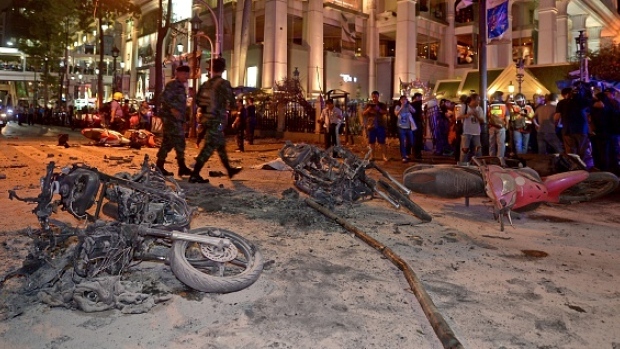 The final possibility floated was that the bombing was carried out by US-backed, deposed prime minister Thaksin Shinawatra, whose violent political front has visited mass murder and terrorism systematically upon Bangkok over the past decade. In 2010, Shinawatra would deploy some 300 heavily armed militants in Bangkok, triggering gun battles that turned the capital into a warzone, killing nearly 100, and injuring over a thousand more. The violence culminated in city-wide arson resulting in billions in damage. In 2013-2014 when protesters took to the streets to call for the ousting of Shinawatra’s sister, Yingluck Shinawatra, who held office in his place from 2011 until 2014 when the military ousted her in a swift and bloodless coup, Shinawatra would again deploy militants into the streets. Using assault rifles and grenades, these militants would kill nearly 30 and injure hundreds more. Since the 2014 coup that ousted Shinawatra, there have been several small bombs linked to Shinawatra’s political movement and perceived as warnings to the military to cease efforts to uproot his grip on the country and make concessions. It was long feared that if these concessions weren’t made, deadlier blasts, like the one observed on Monday, would follow. With the singular common denominator between all three suspects being US backing, the question remains, why Thailand? Cold War-centric commentators like to point out what they call an “all American-made” Thai military arsenal, however much of Thailand’s US-made hardware is antiquated, including Vietnam War-era M60 tanks, M113 armored personal carriers, and relatively newer but still aging F-16s – all of which are being systematically replaced with non-US alternatives. This includes 400 Type-85 armored personal carries from China, T-84 main battle tanks ordered from pre-Euromaiden Ukraine, and likewise over 200 Ukrainian BTR-3 armored personal carriers. 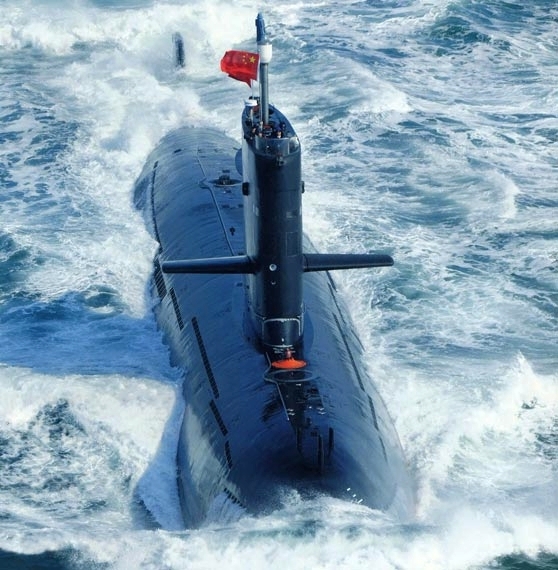 Most recently, and perhaps most significantly, was Thailand’s approval of purchasing a small fleet of Chinese Type 039A diesel-electric attack submarines. Thailand’s move to purchase Chinese submarines has exacerbated tensions with the US and poses a challenge to Washington’s “pivot” to the Pacific. The military junta, which declared a coup in May 2014 and created the National Council for Peace and Order, could turn to China for political and military support and cooperation, analysts said. The junta-led Cabinet approved the purchase of three Type 039A (Yuan) attack submarines in early July. Thailand’s alliances have been steadily shifting from West to East for years. And part of this shift included undermining, ousting, and finally completely uprooting the political networks of Thaksin Shinawatra – cultivated and in service of US foreign policy since as early as the 1990’s. In the late 1990’s Shinawatra was an adviser to notorious US private equity firm, the Carlyle Group and described himself as a personal friend of the Bush political dynasty. He pledged upon taking political office that he would continue to serve as “matchmaker” between US interests and Thailand’s resources. In 2001 he privatized Thailand’s resources and infrastructure including the nation’s oil conglomerate PTT – which was sold off to foreign interests including Western oil companies, Chevron, Exxon, and Shell. In 2003, Shinawatra would commit Thai troops to the US invasion of Iraq, despite widespread protests from both the Thai military and the public. Shinawatra would also allow the CIA to use Thailand for its abhorrent rendition program. In 2004, Shinawatra attempted to ramrod through a US-Thailand Free-Trade Agreement (FTA) without parliamentary approval, backed by the US-ASEAN Business Council who just before the 2011 elections that saw Shinawatra’s sister Yingluck Shinawatra brought into power, hosted the leaders of his “red shirt” “United Front for Democracy against Dictatorship” (UDD) in Washington DC. 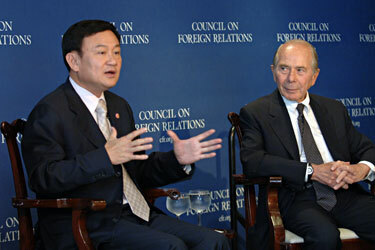 Since the first coup in 2006 aimed at his regime, Shinawatra has been openly represented by US corporate-financier elites via their lobbying firms including, Kenneth Adelman of the Edelman PR firm (Freedom House, International Crisis Group,PNAC), James Baker of Baker Botts (CFR, Carlyle Group), Robert Blackwill (CFR) of Barbour Griffith &amp; Rogers (BGR), Kobre &amp; Kim, Bell Pottinger (and here) and currently Robert Amsterdam of Amsterdam &amp; Partners (Chatham House). And from 2006 until now, both Western political and media circles have continuously provided favorable spin for Shinawatra and his political proxies. This includes the use of the above mentioned Freedom House and its umbrella organization, the US National Endowment for Democracy (NED) to fund and back nongovernmental organizations (NGOs) and academics in Thailand to provide rhetorical and operation support for Shinawatra and serve as a constant source of sociopolitical subversion aimed at Thailand’s current ruling establishment. Recently, with the appointment of Glyn Davies as US Ambassador to Thailand, a War College graduate specializing in nonmilitary use of force to upturn the sociopolitical order of a targeted nation, it is clear that America is still committed to installing Shinawara into power. With the current Thai government openly committed to permanently removing Shinawatra from power, with the US lacking any viable alternatives, and with Shinawatra’s already questionable public support fading quickly, few options are left to save an increasingly desperate bid to keep Thailand in America’s geopolitical orbit. Former Shinawatra lobbyist, Bush-era administrator, and US policymaker Robert Blackwill published earlier this year the latest iteration of US’ “grand strategy” toward China. A rehash of a decades old conspiracy to encircle, contain, and “integrate” China into a US-dominated “international order,” the policy paper is an important reminder of what exactly the US is truly trying to achieve in Asia. That Robert Blackwill is writing US policy aimed at containing China already unfolding across Asia, and was also a lobbyist for Thaksin Shinawatra who ruled over America’s client regime in Thailand for over a decade, is indicative of exactly how America plans to implement unpopular policies in nations that otherwise will not benefit from them. Attempts to install client regimes across all of Southeast Asia through US-backed color revolutions and political subversion have taken place in Myanmar with US-British backed Aung San Suu Kyi and her “saffron” colored protesters, in Malaysia with the US-funded yellow-shirted Bersih street movement and its leader Anwar Ibrahim, and in Thailand through Thaksin Shinawatra and his “red”street mobs. The violence that accompanies these efforts is similar to that seen during the US-engineered “Arab Spring” and more recently in Ukraine where US politicians literally took to the stage at Neo-Nazi political rallies held during the “Euromaiden.” When efforts to subvert a nation fail, violence often follows. Libya and Syria, whose governments resisted street demonstrations and US calls for sitting governments to stand down, unraveled into proxy wars waged by the US through terrorist groups. The escalation in violence against Thailand appears to be simply the latest attempt by the US to strong-arm a world increasingly slipping out from under its long-standing global “primacy.” The US has specifically cultivated multiple vectors with which to visit violence and terrorism upon Thailand – terrorists operating under cover of Thailand’s southern violence, Uyghur terrorists it openly backs in China, and supporters of the ousted Shinawatra regime. 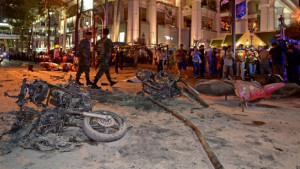 By targeting Chinese tourists, the attack on Monday constitutes a well-planned precision strike on Thailand’s tourist industry and in turn, its economy. Chinese tourists make up the largest demographic travelling Thailand. Should Thailand successfully escape out from under US plans to maintain “primacy” in Asia, other nations are likely to follow. Considering how far the US has gone to prevent other nations from drifting away from its orbit and endangering it unwarranted global power and influence, Monday’s bombing comes as no surprise. In the long run however, Thailand’s leadership surely understands that capitulating to US demands will not spare the Thai people and their future aspirations from violence and chaos. If Thailand must endure tragedy, it must do so with its sovereignty and dignity intact. While Blackwill’s policy paper notes that any move by China to aggressively counter American moves in Asia will only drive other nations deeper into America’s arms, the same is true for American aggression driving Asian nations closer together – eventually pushing the US out completely, and establishing a more sensible “Asian primacy” in Asia.